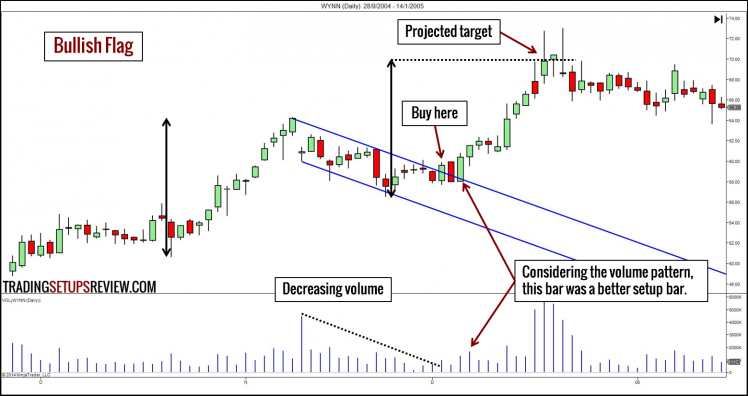 Do you look at price charts for your trading? But what do you see? These are 10 chart patterns that every price action trader should see when they look at a price chart. The first five chart patterns are reversal patterns. Typically, they start by trying continue the trend. When that last-ditch attempt fails, the reversal is confirmed. However, remember that most reversal patterns fail, especially when the trend is strong. Hence, trade them carefully. What does a Head & Shoulders pattern look like? The bullish pattern has three swing lows. The middle swing low is the lowest. The line connecting the two swing highs is the neckline. The bearish pattern has three swing highs. The middle swing high is the highest. The line connecting the two swing lows is the neckline. 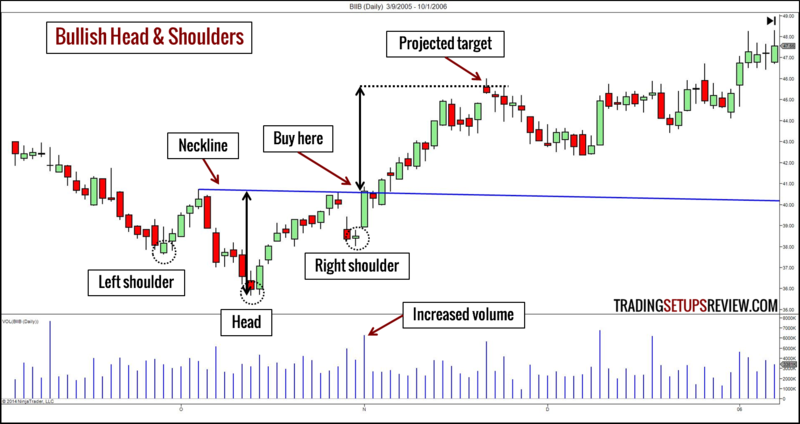 What does a Head & Shoulders pattern mean? In the bullish instance, the left shoulder and the head highlight the downwards trend. The right shoulder, by ending above the head, halts the bearish trend. The break of the neckline then confirms a change of trend. Hence, the Head & Shoulders pattern is a reversal chart pattern. The same logic works for the bearish pattern as well. How do we trade a Head & Shoulders pattern? As it is a reversal chart pattern, we need an existing trend to reverse. A bullish pattern must take place in a downwards trend, and a bearish pattern should take place in a upwards trend. Generally, the longer the trend, the larger the Head & Shoulders formation needed to reverse it. On pullback to the neckline after the break-out. Volume should increase on break-out. For the target objective, measure the distance between the neckline and the head. Then, project the distance from the break-out point. What does a Double Top / Bottom pattern look like? A Double Bottom has two swing lows at around the same price level. The swing high in between them projects a resistance line. A Double Top has two swing highs at around the same price level. The swing low in between them projects a support line. What does a Double Top / Bottom pattern mean? In a Double Bottom, the first swing low marks the extreme low of a downwards trend. When the second swing low fails to push below it, it is a warning that a reversal might occur. Once the market breaks above the resistance level, it confirms the bullish reversal. In a Double Top, the same logic applies and leads to a bearish reversal. How do we trade a Double Top / Bottom pattern? As it is a reversal chart pattern like the Head & Shoulders, we must have a trend for the pattern to reverse. Do not look for reversal patterns like the Double Top / Bottom in a sideways market. On pullback to the resistance line (now acting as support) after the break-out. On pullback to the support line (now acting as resistance) after the break-out. Volume should increase as price breaks out of the resistance/support line. 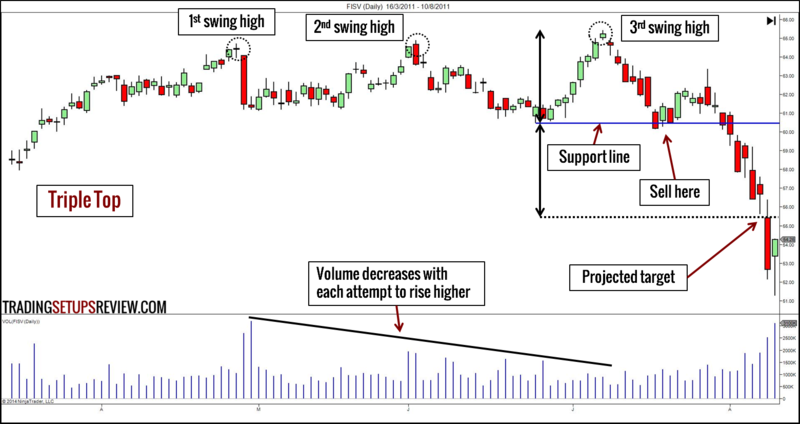 To get the target objective, measure the height of the pattern and project it from the break-out point. What does a Triple Top / Bottom pattern look like? If you can find a Double Top / Bottom, looking for a Triple Top / Bottom is straightforward. 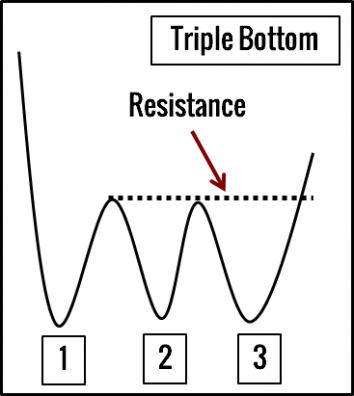 A Triple Bottom has three swing lows at around the same price level, and a Triple Top has three swing highs at around the same price level. You can also relate it to the Head & Shoulders chart pattern. Just that in this case, the middle pivot is equal to the other two pivots. What does a Triple Top / Bottom pattern mean? The Triple Bottom represents two failed attempts to push below the support established by the first swing low. Naturally, it hints at a trend reversal. A break-out above the resistance line confirms the reversal. Similarly, the Triple Top shows two unsuccessful tries to continue an upwards trend and signifies a bearish reversal. How do we trade a Triple Top / Bottom pattern? The trading method is akin to the Double Top / Bottom chart pattern. 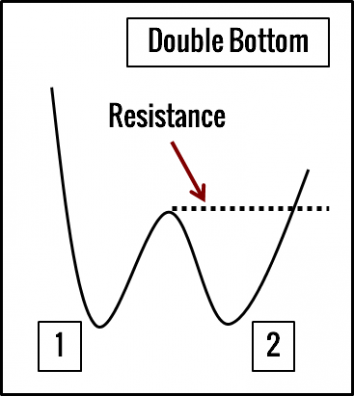 However, drawing the resistance line of a Triple Bottom might be tricky, especially if the two swing highs are unequal. Somewhere in the middle of the two swing highs. Somewhere in the middle of the two swing lows. Volume should increase when price breaks out of the resistance/support line. It should also decrease with each upswing in the case of a Triple Top. For a Triple Bottom, volume should decrease with each down swing. For the target objective, measure the height of the pattern and project it from the break-out point. What does a Rounding Top / Bottom pattern look like? A Rounding Top consists of minor price swings that rise and fall gradually, presenting a dome shape at the top of the chart. Flip a Rounding Top vertically, and it becomes a Rounding Bottom. Rounding Tops / Bottoms usually take a long time to form and are found more often on weekly charts. What does a Rounding Top / Bottom pattern mean? 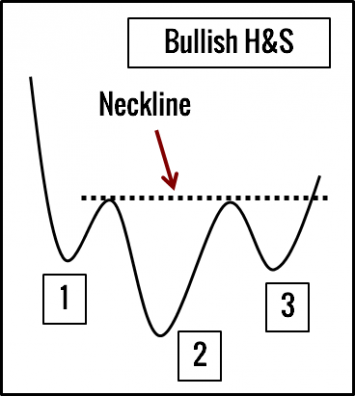 A Rounding Top shows a gradual change of market sentiment from bullish to bearish. 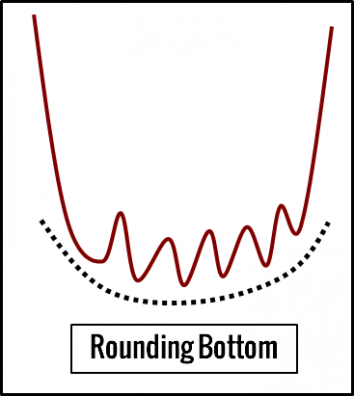 A Rounding Bottom implies a sentiment change from bearish to bullish. This reversal formation is relatively subdued. How do we trade a Rounding Top / Bottom pattern? For a Rounding Bottom chart pattern, buy when price closes above the high of the pattern. For a Rounding Top chart pattern, sell when price closes below the low of the pattern. 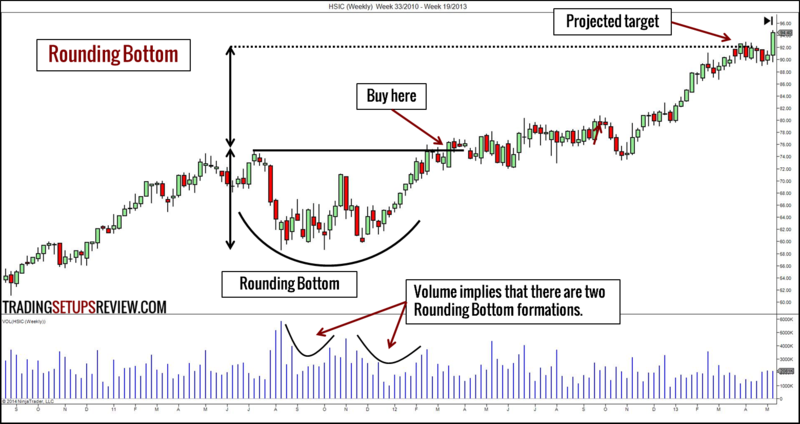 You can take a more aggressive entry by looking for short-term price patterns before the completion of the pattern, especially if the volume pattern is encouraging. Volume should decrease towards the middle of the pattern and rises again towards the end of it. What does an Island Reversal pattern look like? An Island Reversal is a piece of price action that is completely broken off from the rest of the chart. It has a gap before it (Exhaustion Gap) and a gap after it (Breakaway Gap). A bullish Island Reversal starts with a down gap in a bear trend. 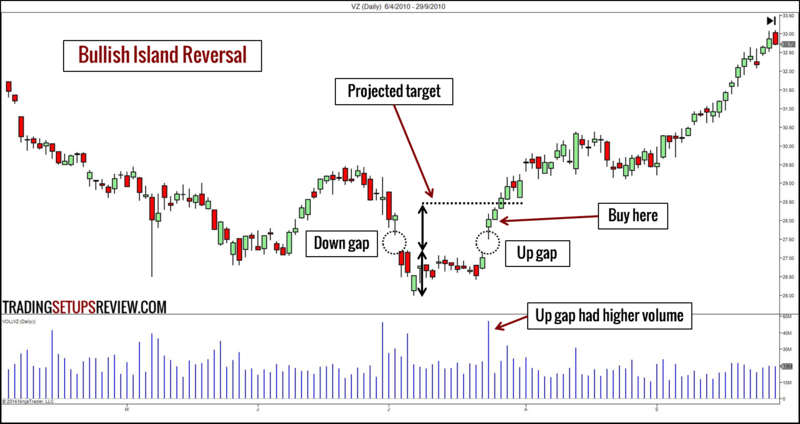 After a period of sideways trading, the market gaps upwards to reverse the bearish trend. 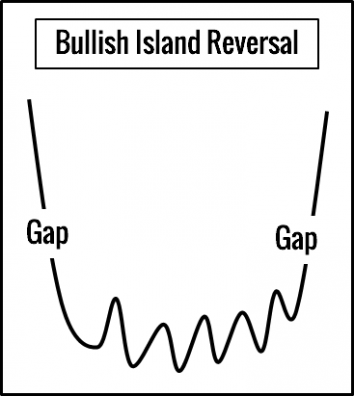 A bearish Island Reversal starts with an upwards gap, followed by sideways trading before reversing the trend with a downwards gap. In both cases, the two gaps must have overlapping price range. 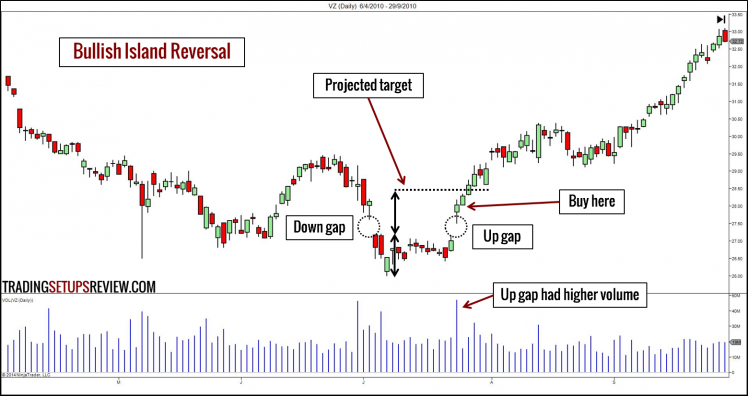 What does an Island Reversal pattern mean? The first gap represents a climatic move aligned with the existing trend. However, instead of following through with the gap’s momentum, the market meanders. Hence, when the market makes a gap against the trend, it is a reversal signal. The logic behind this chart pattern is similar to the Morning Star and Evening Star candlestick patterns. How do we trade an Island Reversal pattern? For a bullish pattern, buy when price gaps up away from the Island. For a bearish pattern, sell when price gaps down away from the Island. For this chart pattern, volume should decrease for the first gap and increase with the second gap that is reversing the trend. For the target objective, measure the height of the Island and project it from the breakaway point. As price retraces in a trending market, it forms a variety of continuation chart patterns. To find these chart patterns, simply draw two lines to contain the retracing price action. Draw one line above the retracement (“resistance”) and one line below it (“support”). As you will see below, the relationship between these two lines will help us differentiate the continuation chart patterns. What does a Rectangle pattern look like? If two horizontal lines surround a retracement, it is a Rectangle chart pattern. Both the bullish and bearish Rectangle patterns looks the same. However, they appear in different trend context. What does a Rectangle pattern mean? A Rectangle chart pattern indicates sideways action. When the market enters in a congestion phase, it is likely to break out in the direction of the preceding trend. How do we trade a Rectangle pattern? 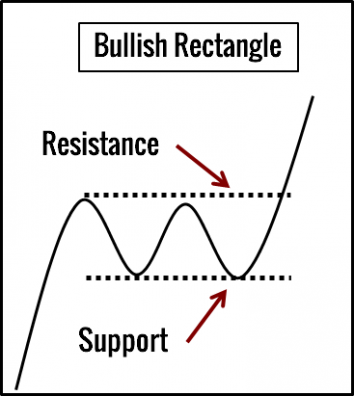 Remember that the trend before the Rectangle chart pattern determines if the pattern is bullish or bearish. A Rectangle pattern continues the prior trend. Volume should increase when price breaks out of the resistance/support line. For the target objective, measure the height of the Rectangle and project it from the break-out point. What does a Wedge pattern look like? For a Wedge pattern pullback, the two lines converge. A bullish Wedge chart pattern takes place in an upwards trend, and the lines slope down. It is also known as a Falling Wedge. 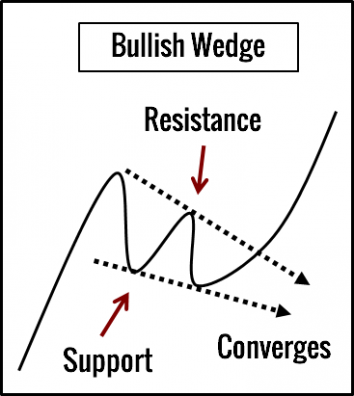 What does a Wedge pattern mean? The defining feature of a Wedge chart pattern is the set of converging trend lines. It means that the magnitude of the swings within the Wedge pattern is decreasing. This contraction in swing magnitude implies that the Wedge is moving against the path of least resistance. Hence, when the market moves decisively with the trend, it confirms that the trend is resuming. How do we trade a Wedge pattern? For a bullish pattern, buy when price breaks above the resistance. For a bearish pattern, sell when price breaks below the support. 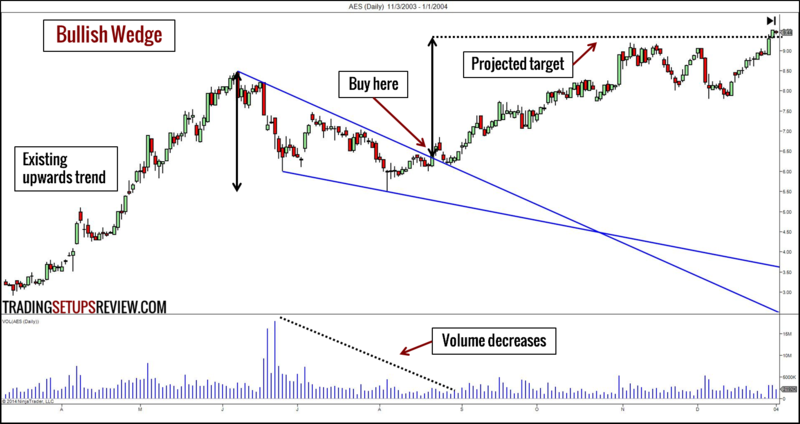 Volume should decrease as the Wedge pattern forms, and increase with the break-out. For the target objective, measure the height of the entire Wedge pattern and project it from the break-out point. What does a Triangle pattern look like? There are three types of Triangle chart patterns. What does a Triangle pattern mean? 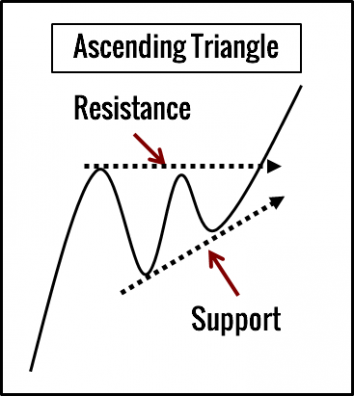 An Ascending Triangle pattern is a bullish chart pattern. It shows the market in a pause during an upwards trend. However, the rising swing lows imply bullishness. By the same logic, a Descending Triangle pattern, with the lower swing highs, is a bearish pattern. The Symmetrical Triangle is a continuation pattern as well. However, its directional tendency is less obvious. It depends on the trend in which it forms. Thus, it is bullish when it forms in a bull trend and bearish in a downwards trend. How do we trade a Triangle pattern? In a bull trend, buy on break-out above an Ascending Triangle or a Symmetrical Triangle. In a bear trend, sell on break-out below a Descending Triangle or a Symmetrical Triangle. 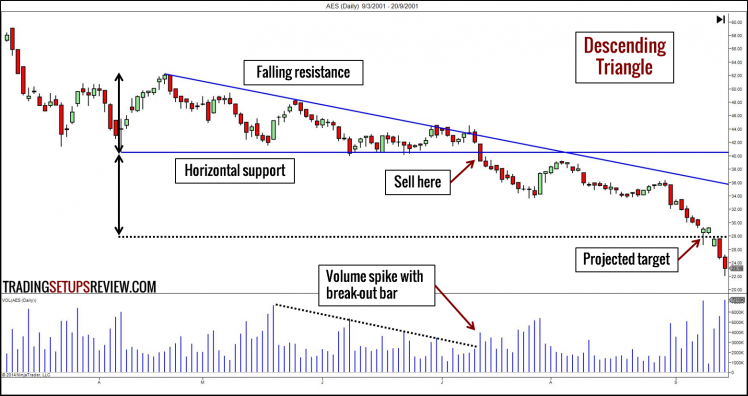 Volume should decrease as the Triangle chart pattern forms, and increase with the break-out. For the target objective, measure the height of the widest part of the Triangle and project it from the break-out point. What does a Flag pattern look like? A Flag pattern has a flag pole and a flag. The flag pole is a sharp thrust in the direction of the trend. Identifying the flag pole is critical for the Flag pattern. 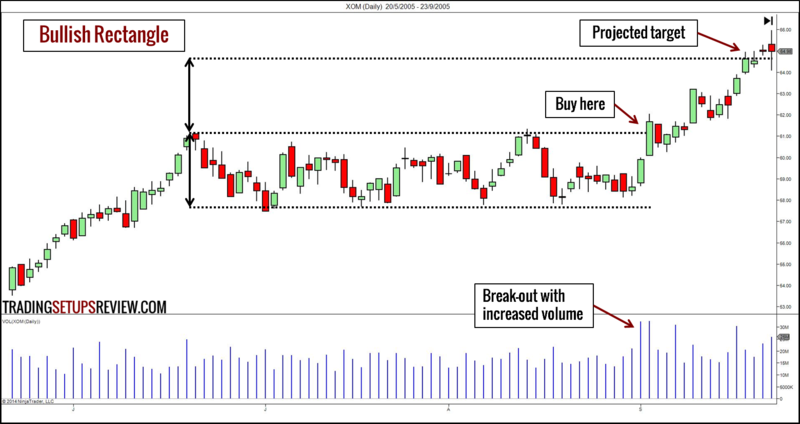 Look for strong and obvious price thrusts with consecutive bars, gaps, and strong volume in the same direction. For a bullish Flag pattern, we need an up thrust as the flag pole. The flag is made up of two parallel lines that slope downwards. The bearish Flag pattern has a down thrust as the flag pole. The two lines making up the flag are also parallel, but slope upwards. What does a Flag pattern mean? 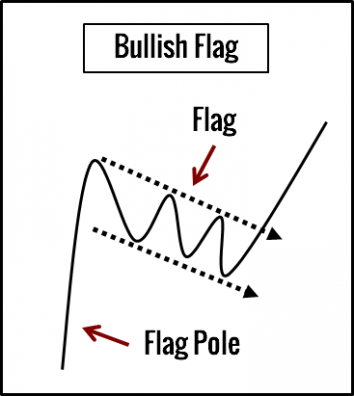 The key feature of a Flag pattern is the flag pole which is a powerful price move. The Flag pattern represents a short break before the market continues moving in the same direction. Hence, it is an ideal continuation chart pattern. How do we trade a Flag pattern? Buy on break-out above a bullish Flag pattern. Sell on break-out below a bearish Flag pattern. Volume should decrease as the Flag pattern forms, and increase with the break-out. The target projection for a Flag pattern is different from the other chart patterns. Measure the height of the flag pole. Then, extend it from the lowest point of a bullish flag or the highest point of a bearish flag. What does a Cup & Handle pattern look like? The cup looks like a Rounding Bottom. The handle, which follows the cup, looks like a typical retracement (for e.g. Wedge, Flag). The Cup & Handle chart pattern is a bullish pattern. Its bearish counterpart is the Inverted Cup & Handle pattern. What does a Cup & Handle pattern mean? 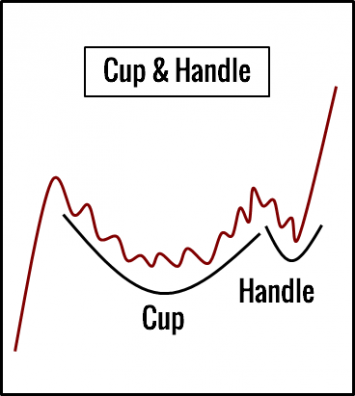 A Cup & Handle pattern is basically a Rounding Bottom following by a pullback. Hence, it marks a period of consolidation in which the bulls take over from the bears gradually. The last retracement (handle) is the last bearish push. When it fails, we expect the market to rise. An Inverted Cup & Handle pattern follows a similar logic with a Rounding Top and a pullback upwards. How do we trade a Cup & Handle pattern? 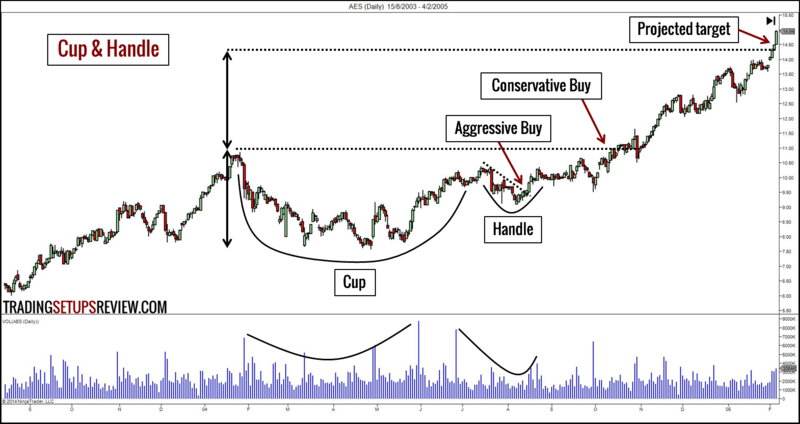 The conservative entry for the Cup & Handle chart pattern is to buy on break-out of the high of the cup. The aggressive entry can take place once the handle pullback fails. For the Inverted Cup & Handle pattern, you can sell when the market breaks below the low of the cup or when the handle pullback breaks down. The volume pattern should resemble that of a Round Top / Bottom for both the cup and the handle formations. For the target objective, measure the depth of the cup and project it from its high (or low for the Inverted pattern). To learn more about trading with the Cup & Handle pattern, refer to How to Make Money in Stocks: A Winning System in Good Times and Bad, Fourth Edition. Trading examples of chart patterns (including those above and on other websites and books) are usually textbook examples. The purpose is to show the ideal form of chart patterns working effectively. This is why the target objectives seem magically achieved each time. However, like any other trading methods, chart patterns fail. To get a realistic idea of the success rate of chart patterns, there is no better resource than Encyclopedia of Chart Patterns by Bulkowski, Thomas . It has extensive performance statistics and ranking of most chart patterns. Thomas Bulkowski’s research uses rigid definitions of chart patterns which are reasonable for his purpose. However, in fact, most traders differ in the way they find chart patterns as they look at price swings (degree of swing) and draw trend lines (ignore or include candle shadows) differently. This is not a problem because trading chart patterns is, in any case, beyond simple pattern recognition. Using chart patterns in isolation is not a winning strategy. Instead, include volume, short-term price patterns, and other support/resistance tools to pinpoint trading opportunities. 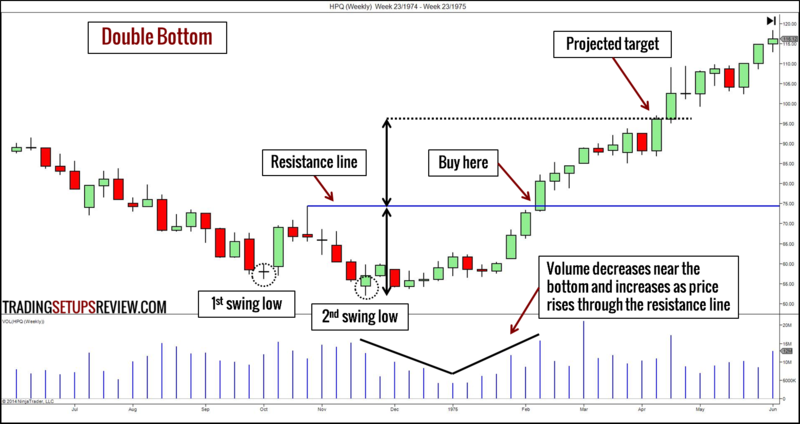 While the target projection of chart patterns is a valuable tool for target setting, combine the projected target with other support/resistance levels for better results. With experience, you will also realise that the simplistic classification of the patterns into reversal and continuation does not always apply. The trading rules of each chart pattern are more like guidelines. Hi Ad, I’m very happy when I read your post. Thank you so much. I don’t understand that with patterns above if I trade daily time frame that one candle is one day. But to take profit I need more than one candle. Ex: in pattern 1. HEAD & SHOULDERS, take profit with many candles from entry point. so how can can take profit for one day. Thanks! Can I see in the H4 chart to decide profit and then entry in daily chart? For the examples above, I used the daily time frame to show swing trading examples. I think you are referring to intraday trading like H4 and below. For day trading, you will not be spotting the chart pattern on daily charts. Instead, you will focus on finding the same patterns on intraday time frames (typically 5 min to 4 hours). For instance, you can use the H4 chart to enter and exit. I understand that , if I see in the H4 chart and I found a pattern, but take profit point need 4 -> 5 candles (Ex) I will calculate number of pips and then I check out to Daily chart and trading with calculate of entry pips above. right ? I’m not sure I’m getting you correctly. Let me know if I’m not. When you find a pattern on the H4 chart, you can simply calculate the target objective and project it within the same H4 chart. Of course, you can evaluate that objective with respect to S/R on a higher time frame like the daily.